He will be 6yrs on January 23. He loves to walk at night and he looks for his leash, if he could he will open the drawer. He likes to play and jump and play tag. 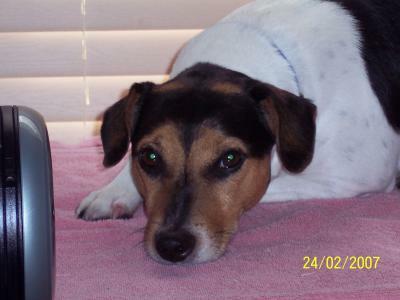 He has a playing companion a rat terrier named Nika. absoultely cute! Wish I could steal him! he looks much younger. He's adorable! Just have to tell you Aida how pretty your Max is. I just want to snuggle with him! he looks so tired but freaking scrumptious. you're dog is so adorable. I would make him my slave hound.